Snails are one of those interesting creatures that depending upon where we find them, we seem to consider them different kinds of animals. Find one in your garden or crawling along the ground and you’ll probably lump it with all the other insects and creepy crawlies that live there. Find one living in water and you might properly identify it as a mollusk. Since I had to put these vintage snail drawings somewhere, I opted for the place I the most biologically correct of all of the categories here on Reusable Art – Nautical & Sealife. 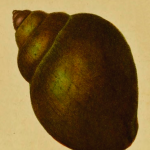 We have a selection of free snail drawings that range from an itty bitty line drawing to colored book plates from a wonderful 1822 natural history dictionary. They don’t all live in the sea but they are are easily identified as snails. All of our snail drawings are at least 70 years old. All of them are in the public domain under the Berne Convention Standards. 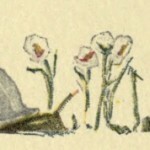 Cartoon-like snail and flowers drawing from 1911. Grey and green snail with white and pink flowers. One flower almost looks like it’s screaming for help. Vintage drawing of a marsh snail shell from the Isle of Wight, off the coast of England. Black and white drawing dates back to 1848. 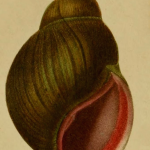 This vintage ramshorn snail illustration includes only the shell of the Planorbis corneus. It is so named because the shell looks so much like a ram’s horn. This large snail drawing is of an African land snail. It is brown, green and golden colored. It is from 1822 and in the public domain. 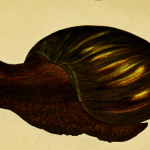 Vintage, copyright free apple snail shell drawing from 1822. It is brown, green and pink colored. Would be great for a craft project. While nothing we have ever encountered was this pretty, this land snail shell drawing features brown and green stripes with a red and pink opening. 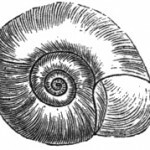 Vintage snail image from 1875. Published without illustrator credit. 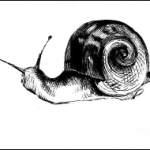 Nice black and white snail drawing/engraving. Copyright free and free to download. Small, vintage drawing of a snail.